This gorgeous and luxurious apartment offers spacious rooms and is suited for family holiday letting. 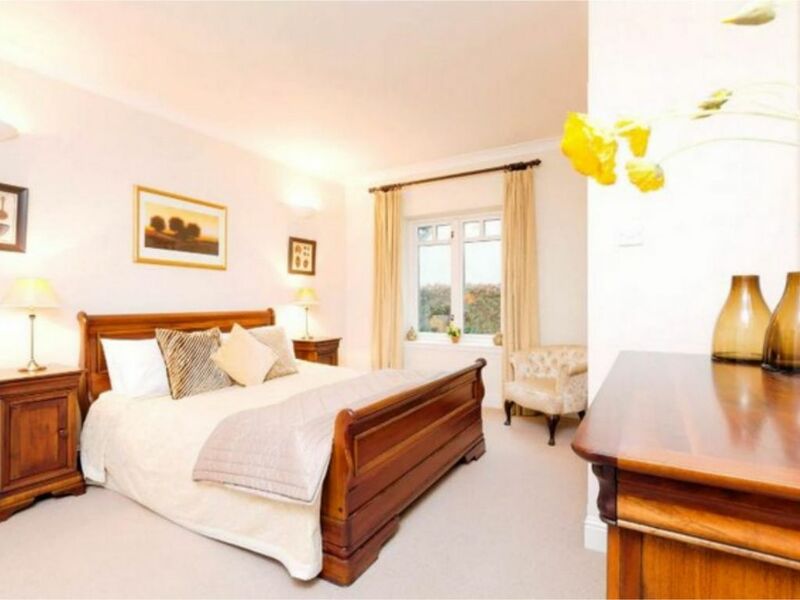 It is set in an up-market area, overlooking a delightful, shared landscaped garden. The apartment is situated in a peaceful cul du sac, with off-road parking. The apartment is quietly located in a highly sought after area, with easy access to the city centre and excellent amenities close at hand. The immaculate property has three pristine double bedrooms, which provides comfortable accommodating for six guests. The master bedroom has an en-suite shower room (also with a toilet, basin, and heated towel rack), the second bathroom is a family bathroom with a bath/shower, toilet, basin, and heated towel rack. In addition to the master bedroom, there are a further two double bedrooms. All bed linen and towels are provided. The large modern kitchen is fully fitted with a washing machine, dishwasher, gas hob, electric oven, kettle, toaster, fridge, freezer, and microwave. The kitchen also has a kitchen table which can accommodate 4 people. There is a separate dining room with a table and six chairs, a separate sitting room with ample space, and a sun room, which all overlook varying aspects of the garden. There is video entry phone in the entrance hall. Central heating provides a warm and welcoming atmosphere. Drying racks for clothes, an ironing board and an iron are available in the apartment. You can relax and recharge your batteries after enjoying a day exploring. A comprehensive range of visitor attractions in Edinburgh and the surrounding areas will keep guests spoilt for choice. You will be able to enjoy the attractions, while using the peaceful apartment as a base to explore from and come home to rest in. If you require the travel cot or highchair, please let the owner know before you make your booking. Scotland has a rich and exciting history. The region has so much to offer, from culture, history, beautiful landscapes, outdoor activities, to its myths and legends. There are numerous festivals held in Edinburgh, and the surrounding areas, throughout the year. It is a wonderful holiday destination with so much to explore and do. Edinburgh itself is packed with historical sites, museums, art galleries, wonderful festivals and events, good eating and a huge variety of shops. Children and families will also love Edinburgh with all the fun activities, including the Edinburgh Zoo, Ocean Terminal - explore the Royal Yacht Britannia, have a fun walk and tea at the Royal Botanical Gardens, experience hands-on activities at the National Museum of Scotland, get "eye-boggled" at Camera Obscura and World Illusion, get shaken at Our Dynamic Earth, participate in the Science festival, walks along the beach front or canal. Don't miss the Edinburgh Castle, Palace of Holyroodhouse, interesting shops and museums along The Royal Mile, fun bus tours of the city, or discover the secrets of the underground streets in Edinburgh (if you are feeling brave!). Edinburgh also caters for sporting enthusiasts, with walking and cycling paths in the city, numerous golf courses, tennis and sport facilities scattered throughout Edinburgh, ski slopes and great hiking country not far from the city. In the immediate area around the apartment, you can enjoy Cramond Beach or stroll along the River Almond. There is a lovely wide walking / cycling path running next to the beach that heads in the direction of Ocean Terminal. Explore Cramond Island (but watch out for the tide), or nearby Lauriston Castle. For golfing enthusiasts, there are two golf courses in the Barnton area. Not only are you spoilt for choice in Edinburgh city, but further afield there are also tons of things to see and do. There are excellent sites and activities for all the family, from young to old. Hopetoun House, before the Queensferry bridge is a wonderful place to walk in the gardens, explore the house and top it all off with a lovely tea or lunch. They also hold various events throughout the year including the summer fair, the Christmas fair and lots of fun activities for children. There is the famous Roslyn Chapel (mentioned in Dan Brown's book on the Da Vinci Code), with its interesting marks and centre healing spot. Cragie's Farm is a fun spot for families - pick strawberries and raspberries, do the nature trail, and enjoy some lovely eats. You are not far from the Scottish Borders area in the south, and heading north you soon reach the Scottish Highlands. If you have a car and want to go further afield there is so much to see in these areas as well. However, Edinburgh itself will probably be enough to keep you busy! Contains fridge, freezer, washing machine, dishwasher, oven, 5 plate hob, microwave, toaster, kettle, dishes and utensils, etc. Lovely, comfortable dwelling. Fully stocked kitchen made for a very pleasant stay. Super, modern, graciously spacious. It exceeded our expectations. Our stay was excellent and the apartment was in top condition and had everything that we needed. Communication with the host Julie was also superb. The area was perfect to visit past haunts in Edinburgh and to complete touring over the Forth Bridges into Fife and beyond and down to the Border areas. We would certainly recommend this property without hesitation for couples or Parents with a family. ‘As advertised’ - and much more! Beautifully spacious, sparklingly clean, fully equipped, very warm - and impeccably detailed directions. Being helpfully close to the airport was the icing on the cake. Thank you for your feedback, we are pleased you enjoyed the apartment and found it extremely clean and to a high standard. I am sorry you didn’t contact us during your stay about the heating, as the heating system works very well and it is easy to adjust to meet individual needs. Temperature settings are an individual preference, with some people preferring a warmer environment while and others prefer it to be slightly cooler, especially for sleeping. In winter, the apartment is generally set to around 22 degrees Celsius (71,6 degrees Fahrenheit) to try to meet the majority of needs in keeping the apartment cosy but not overheated. However, this temperature can easily be changed to either a warmer or cooler setting, according to the guests’ preferences. Thank you once again, it was a great pleasure having you and your family to stay. We hope you have the opportunity to visit again, and we would love to welcome you back in the future. A lovely property just ideal for a weeks break to see the sight of Edinburgh and surrounding areas. The property was very clean and well maintained. It had everything a family needed. Home from home. Rates are subject to change until reservation is confirmed. The damage deposit is refunded about 14 days after your stay if there is no damage to the property. This is a strictly no smoking property. If smoke or a smoking smell is detected in the property the damage deposit will be forfeited.